With memorial day weekend all but here I know that a vast majority of you will be spending some time at a get together, cookout, or picnic of some kind. And from that weekend through the summer months there are lots of opportunities to bring a dish to pass to lots of different types of summer functions. 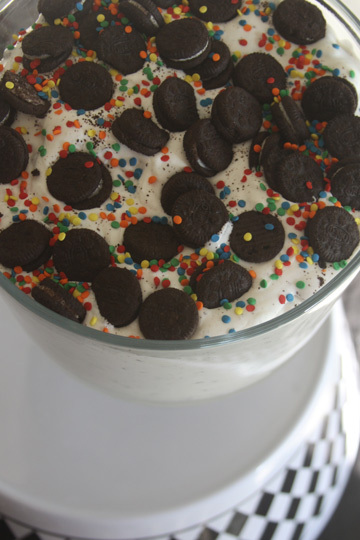 Here is a simple dessert recipe that is sure to be a hit! 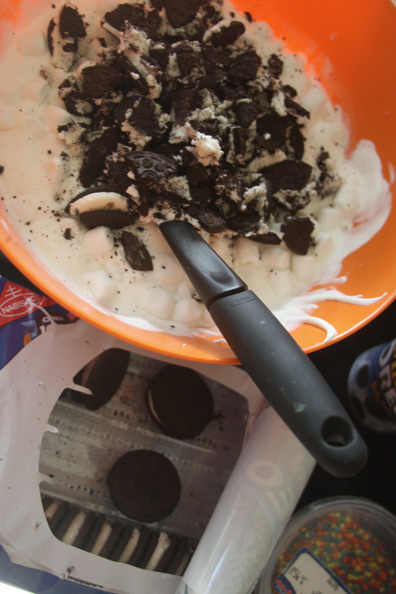 This Oreo Fluff recipe is quick and easy to make, but is packed full of creamy cookie goodness. Guests of every age will enjoy this light fluffy dessert and I know you won’t leave with leftovers! Take it to your next function to please a crowd. I love these types of recipes, you know the kind where you can dump, mix, and go. It seems the summer months, for us, are packed full of get-togethers and activities and we are always pinched for time. When I know I have to have a dish to pass – I think simple is better. The less stress in preparing food and everyone equal more fun for me. 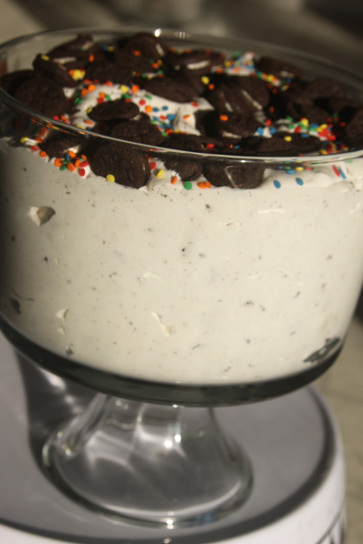 So here is one of my favorite summertime dishes to pass when it’s make turn to bring dessert. 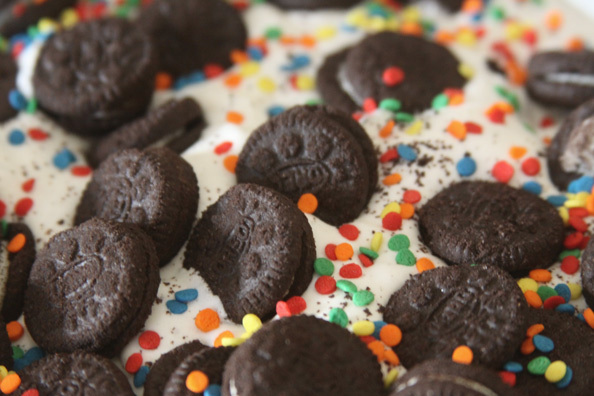 Who doesn’t love a good Oreo cookie, right? Crush them up and whip them into a light and fluffy combination of ingredients and it’s a match made in heaven. I found this recipe on the amazing food blog Chef In Training and tweeked it just a tiny bit – mainly just to add alittle fun to the topping. She has so many amazing recipes on her blog – you must check her out! 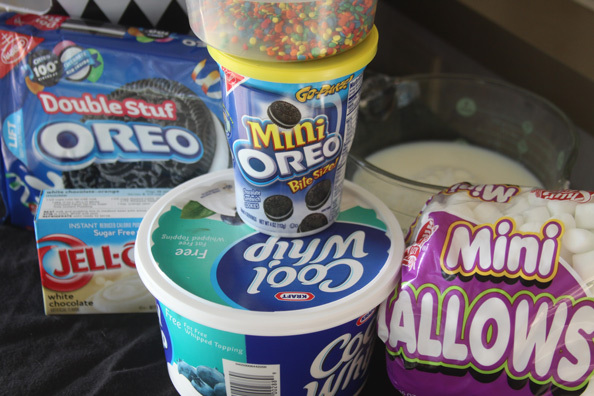 The mini Oreos on top are completely unnecessary, but really really fun! A super cute way to serve up a fun summertime dessert! 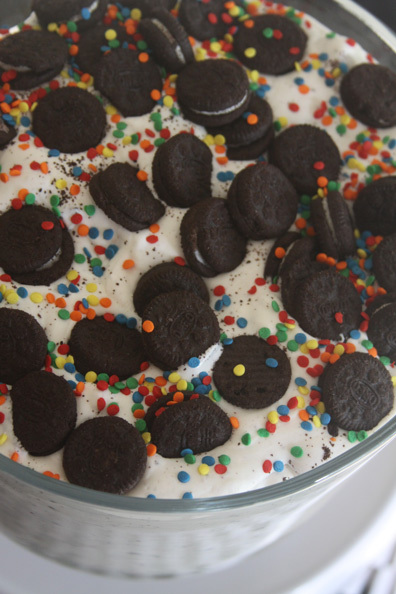 Plus everyone at the get together knows that there are Oreoes in the fluff! Make it, try it, love it! I can almost guarantee you will make this recipe more than once this summer if you give it a try, and your kiddos and the hubby will thank you for it too! Hope everyone has a safe and happy Memorial Day weekend!